Home » Category 1. » Negombo Fishers Continuing the protest for the third day and toughen to a Hunger Strick. Negombo Fishers Continuing the protest for the third day and toughen to a Hunger Strick. Fishers who came to the road on Monday (16th June) asking for fuel subsidiary for boats that was given after sudden increase of Fuel price by a considerable amount in 2012 February or decrease fuel price by 35 Rupees per liter. After the walking protest they have invade the Municipal front yard and settle down for a longer and stronger fight for a reasonable solution on the issue instead of compensation with Fisheries instrument fraud offered by the fisheries ministry. 3 fishers are involved in Hunger strike while hundreds of supporters are hanging around. 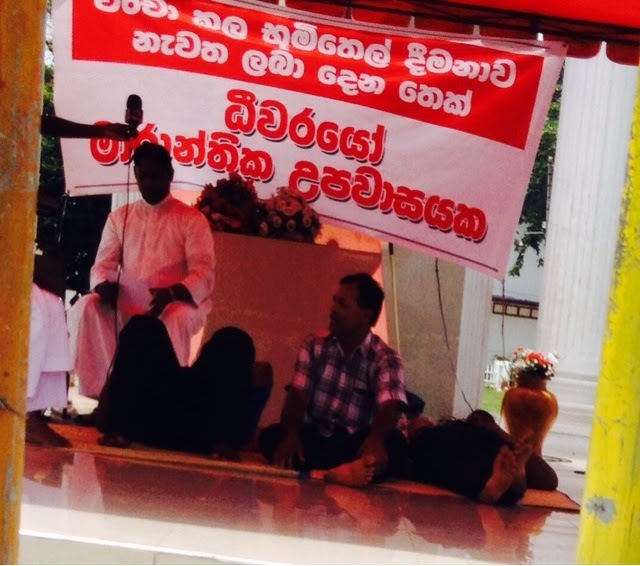 Catholic Church and several fisher unions in Negombo are leading the protest.